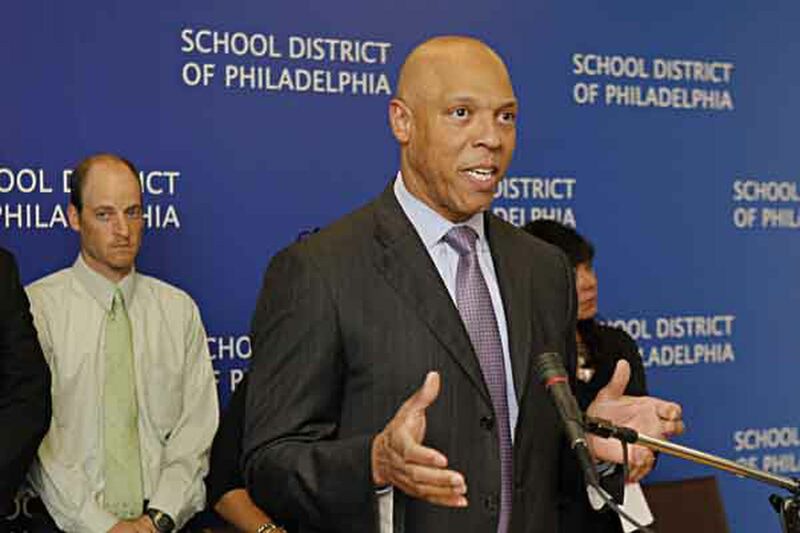 Philadelphia Superintendent William R. Hite Jr. announced Friday that the School District had begun mailing layoff notices to 3,783 employees, informing them they will lose their jobs July 1 because of the district's financial crisis. The list includes 676 teachers, 283 counselors, 127 assistant principals, and 1,202 noontime aides. "These … employees are more than numbers: these are people — professionals — who play important roles in the lives of thousands of students throughout our city," Hite said at a news briefing. He called the layoffs "nothing less than catastrophic for our schools and students. "Every aspect of the district will feel the impact — schools, regional offices, and central office — along with employees ranging from senior administrators to support staff." District spokesman Fernando Gallard said the layoffs were the largest in recent memory. Officials said more jobs would be lost. Friday's round involved school-based workers. Layoff notices are to be mailed next week to an unknown number of employees at district headquarters at 440 N. Broad St.
Hite, who has led the district for less than a year, has spent much of his time trying to avert financial ruin. Facing a $304 million shortfall in the fiscal year that begins July 1, the School Reform Commission adopted a budget May 30 that Hite has said would be catastrophic for city schools. Jerry Jordan, president of the Philadephia Federation of Teachers, said: "Today we are seeing what a 'doomsday' budget looks like for Philadelphia's schoolchildren, and how our city's educators are paying the price for a deficit we didn't create." Under the terms of the current PFT contract, the teacher layoffs are based on seniority, with the newest hires most likely to lose their jobs. They include math, English, reading, elementary, and special-education teachers, as well as music teachers who are assigned to several schools. In an e-mail sent to district employees late Thursday, Hite said he was "profoundly upset" to be forced to take such draconian measures and pledged to continue to advocate for more money from the city and the state to cover the shortfall that had triggered the layoffs. He said he hoped that the budget the SRC adopted could be amended when additional funds become available and that "we are able to restore many of the positions, programs, and services that are crucial to maintaining nurturing and effective learning environments." Hite has asked for $60 million in extra funding from the city and $120 million from the state. The district also is seeking more than $100 million in givebacks from the PFT. Paul Kihn, deputy superintendent, said that the school-based layoffs would save the distict $215 million; the central savings would be $23 million. Four principals who attended the briefing said they could not imagine operating their schools without assistant principals, secretaries, or noontime aides and with fewer counselors and teachers. Daniel Lazar, principal of Greenfield Elementary School in Center City, noted that his school is one block from the site of Wedneday's fatal building collapse. "Immediately after that occurred, our phones began to ring" and continued to ring all day as anxious parents called the school. Without his office staff and a support worker assigned to Greenfield, Lazar said, "running the school would have been near impossible." Parents United for Public Education said its members were appalled by the massive layoffs and warned they would have devastating consequences for students, schools, and communities. Robert McGrogan, president of the local chapter of Commonwealth Association of School Administrators, said he met with assistant principals a few weeks ago after it became clear their jobs would be eliminated. He said the district met with administrators Friday to tell them how to respond to employees who receive layoff notices. Instead of being able to help principals with that task, he said, assistant principals will be asking questions, too. Public Citizens for Children and Youth decried the layoffs and pointed out that the budget the SRC had adopted "would cut music, art, athletics, counselors, librarians, assistant principals, secretaries among others. Even books and paper will be cut from schools." Donna Cooper, the nonprofit's director, said in a statement: "This is a devastating day for our city's children. The doomsday cuts will turn our schools into glorified day-care centers, depriving students of the proper education they deserve."